CUSTOM FIREPLACE MANTLE & SURROUND IN MAPLE. FINISHED IN SATIN WHITE FEATURING A GRAPE BASKET ONLAY .CHOOSE YOUR PREFERENCE OF WOODS AND FINISHES TO MATCH YOUR HOME DECOR. Dimensions: CUSTOM STYLED TO FIT YOUR HOME. 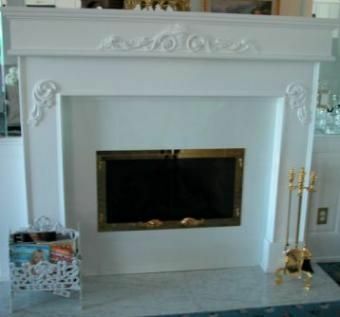 WITH THIS MANTLE WE CUSTOM MADE CABINETS TO COMPLIMENT THE MANTLE. NOTE THE EXTRA DETAILING IN THE GOLD LEAF ON THE FIREPLACE OPENING AND TOOLS.